Keywords : Nanocomposite, Polymer, Drying, Rheology, Structure. The dispersion of nanoscale inorganic fillers within a polymer matrix may potentially lead to a significant improvement of some of its mechanical properties. One of the methods used to prepare these nanocomposite materials relies on solvent evaporation. The formation of the microstructure over the drying process remains poorly understood. For this aim, we chose a system based on a water-soluble polymer, poly(methacrylic acid), the conformation of which is pH dependent, and silica nanoparticles with well-controlled size, geometry and surface functionalization. The solvent used (water) was selected to take into account the environmental issues and to limit the contribution of organic solvents in the preparation of such materials. The purpose is to monitor the drying of these materials and to study their evolution towards the solid state. The results obtained should help understanding the mechanisms involved during drying, their impact on the charge organization and on the mechanical behavior of the final nanocomposites. Phase diagrams of polymer-silica mixtures in solution were determined in order to define the conditions under which phase separation occurs. As these phenomena should be strongly controlled by the polymer / silica nanoparticle interactions, silica nanoparticles with three different kinds of surface groups were prepared. The investigated variables are pH and the polymer concentration with a weight ratio polymer/silica fixed at 4/1. Three phase diagrams were obtained in a pH range of 3 – 9 and a polymer concentration range of 5 – 100 g/L. Every phases were then characterized by TGA (ThermoGravimetric Analysis) and SAXS (Small Angle X-ray Scattering). Exact composition of the phases was deduced from TGA. SAXS allowed us to get information about silica’s and polymer’s organization / local order. The presence of aggregates can be confirmed by analyzing the form factor and the structure factor. A first drying study was performed with droplets under a confined geometry. 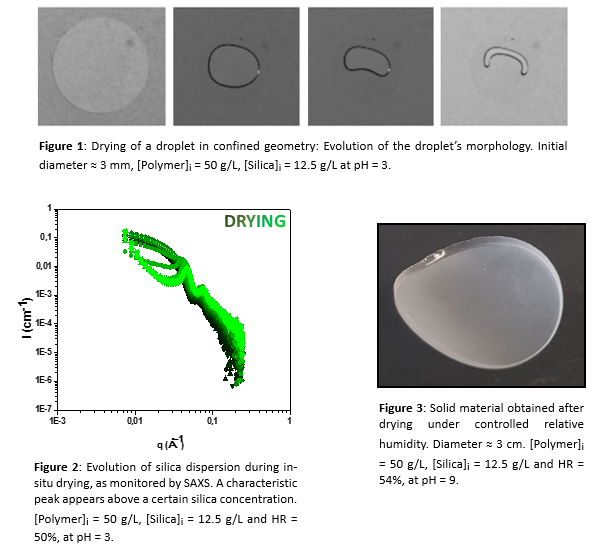 At the macroscopic length scale, direct observation by optical microscope allowed to track the time evolution of droplet’s morphology (Figure 1) and to deduce evolution of the polymer concentration in the droplet. At the nanoscale, in-situ structural characterizations were carried out by SAXS during the drying process (Figure 2). A characteristic peak related to the silica nanoparticle organization appears above a critical drying time (silica concentration). Solid nanocomposite materials were also prepared into a mold with free upper surface and under controlled relative humidity (Figure 3). Structural and mechanical characterizations are planned in the next future.